We study nonlinear viscoelasticity of ligament and tendon. Analysis shows that if a QLV model is assumed for creep, then the relaxation follows a non-separable, non QLV model. Experiment shows that creep rate depends on applied stress and relaxation rate depends on applied strain. This is describable by nonlinear superposition but not by QLV. Experiment shows that creep and relaxation proceed at different rates, a fact that cannot be explained or modeled by QLV. Experiment also shows that recovery occurs at a different rate than creep, in contrast to the prediction of QLV. The non-separable non-QLV approach is simpler than QLV. QLV is more complicated and it does not correctly model the observed behavior. Journal articles by our group and a literature review of other research are provided below. Bottom: recent articles. More recently, ultrasound has been used to study viscoelasticity and injury models in tendon, with the potential for non-invasive measurement in living subjects. Experimental tissue rheology data (Thornton, et al., 1997) show that relaxation proceeds more rapidly (a greater slope on a log log scale) than creep in ligament, a fact not explained by linear viscoelasticity. An interrelation between creep and relaxation is therefore developed for ligament viscoelasticity based on a single-integral nonlinear superposition model. This interrelation differs from the convolution relation obtained by Laplace transforms for linear materials. We demonstrate via continuum concepts of nonlinear viscoelasticity that such a difference in rate between ligament creep and relaxation phenomenologically occurs when the nonlinearity is of a strain-stiffening type, i.e. the stress-strain curve is concave up as observed in ligament. We also show that it is inconsistent to assume a Fung-type constitutive law (Fung, 1972) for both creep and relaxation in ligament viscoelasticity. Using published data of Thornton, et al., the nonlinear interrelation developed herein predicts creep behavior from relaxation data well (R greater than 0.998). Although data are limited and the causal mechanisms associated with viscoelastic tissue behavior are complex, continuum concepts demonstrated here appear capable of interrelating creep and relaxation with fidelity. The image shows ligament structure, after Vanderby. The research is primarily directed toward study of nonlinearly viscoelastic behavior of soft connective tissues, particularly the constitutive behavior representing ligament viscoelasticity. Because of their simplicity, ligaments are chosen as an experimental model. The research is organized as follows. (i) Experimental studies show that defines viscoelastic behavior throughout the range of reversible ligament deformations. This study uses ligament creep and ligament relaxation plus recovery protocols to allow discrimination among various nonlinearities. (ii) A robust viscoelastic constitutive model is developed from experimental data. This model appropriately accounts for nonlinearities and interrelates creep and relaxation. (iii) The reversible deformation limits for levels of applied stress and strain (as a function of load-time) is experimentally identified from the data in (i), thus defining the onset of sub-failure tissue damage for a single overload. A sub-failure criterion for the onset of damage is then formulated. (iv) Creep and relaxation testing are performed on additional specimens to quantify the compromise in mechanical behavior after higher loadings and deformations produce greater levels of tissue damage (from a single overload). (v) The microtrauma and damage associated with irreversible deformations is morphologically characterized using scanning electron microscopy. Nonlinear viscoelasticity is phenomenologically observed in all soft connective tissues. It is axiomatic then that any biomechanical study of these tissues must explicitly or implicitly take this behavior into account. Optimal soft tissue repair or replacement must viscoelastically mimic original tissue. Accurate and robust biomechanical models must reproduce this characteristic behavior. It is therefore sine qua non that nonlinear viscoelasticity be well defined in soft connective tissues. Commonly used viscoelastic descriptions have come into question. They appear inadequate to describe the different rates observed in creep and relaxation of ligaments. Since other soft connective tissues share compositional similarities (collagen fiber reinforced materials with relatively high levels of hydration produced by proteoglycans), it is likely that other soft connective tissues have similar constitutive issues that must be addressed in their viscoelastic descriptions. In addition, current descriptions do not allow comparison of studies performed under different experimental modalities and thereby render many previous studies quantitatively inaccessible. This biomechanical deficiency cannot be rectified with existing data, since with most tissues there never has been a study sufficiently complete to allow discrimination among nonlinearities. An experimental program is being conducted (with a ligament model) involving creep and relaxation experiments at different load and strain levels, with the goal of discriminating among nonlinear representations of ligament viscoelasticity and establishing a robust model. A particular bonus in performing the above systematic study of nonlinear viscoelasticity throughout the range of reversible deformations is that it also identifies the boundaries of that range, i.e. the onset of tissue damage. This is another fundamental aspect of soft tissue biomechanics that has never been adequately defined. Despite a high clinical incidence, a biomechanical criterion for subfailure damage is largely unknown in soft connective tissues, and sub-failure damage is rarely considered as part of biomechanical studies. Articles on ligament and tendon viscoelasticity, mostly experiment Bottom: recent articles. Ligament tissue viscoelasticity is nonlinear. We study the nonlinear behavior of ligament and determine robust integral formulations to describe the nonlinear behavior. Ligaments display time dependent behavior, characteristic of a viscoelastic solid, and are non-linear in their stress-strain response. Recent experiments (Thornton et al., 1997) reveal that stress relaxation proceeds faster than more rapidly than creep in medial collateral ligaments, a fact not explained by linear viscoelastic theory but consistent with non-linear theory by Lakes and Vanderby (1999). This study tests the following hypothesis. Non-linear viscoelasticity of ligament requires a description more general than the separable quasi-linear viscoelasticity (QLV) formulation commonly used. The experimental test for this hypothesis involves performing both ligament creep and ligament relaxation studies at various loading levels below the damage threshold. Freshly harvested, rat medial collateral ligaments were used as a model. Results shown above consistently show a non-linear behavior in which the rate of creep is dependent upon stress level and the rate of relaxation is dependent upon strain level. Furthermore, ligament relaxation proceeds faster than ligament creep, as shown on the right, consistent with the experimental observations of Thornton et al., (1997). The above results are not consistent with a separable QLV theory. QLV fails to describe observed nonlinear creep or relaxation. Inclusion of these nonlinearities requires a more general formulation. For example we have studied nonlinear superposition and the Schapery single integral equations in subsequent efforts. Get pdf. Provenzano, P., Heisey, D., Hayashi, K., Lakes, R. S., and Vanderby, R. Jr., "Subfailure damage in ligament: a structural and cellular evaluation", J. Applied Physiology, 92: 362-371, (2002). Get pdf. Ligament damage occurs with a different threshold in mechanical tests versus in tests of cellular viability. Provenzano, P., Lakes, R. S., Corr, D. T., and Vanderby, R. Jr, "Application of nonlinear viscoelastic models to describe ligament behavior", Biomechanics and Modeling in Mechanobiology, 1: 45-57, (2002). Oza, A., Lakes, R. S. and Vanderby, R., "Interrelation of creep and relaxation for nonlinearly viscoelastic materials: application to ligament and metal" Rheologica Acta, 42, 557-568 (2003). Hingorani, R., Provenzano, P., Lakes, R. S., Escarcega, A., and Vanderby, R., Jr. "Experimental evaluation of nonlinear viscoelastic behavior in rabbit ligament", 40th annual meeting, Society of Engineering Science, Ann Arbor, MI, 15 Oct. (2003). Get pdf or image. Hingorani, R., Provenzano, P., P., Lakes, R. S., Escarcega, A., Vanderby, R. Jr., "Nonlinear viscoelasticity in rabbit medial collateral ligament", Annals of Biomedical Engineering, 32, 306-312, Feb. (2004). Get pdf. Results show that within the physiologically relevant region of ligament behavior, the rate of ligament relaxation is strain dependent in the rabbit MCL, with the rate of relaxation decreasing with increasing tissue strain. The rate of ligament creep is stress dependent in the rabbit MCL, with the rate of creep decreasing with increasing stress. Nonlinearities in rates of creep and relaxation cannot be robustly modeled by the QLV formulation (quasi-linear viscoelasticity). Jensen, K. T. Dwyer, K. W., Lakes, R. S., and Vanderby, R., Jr., "The rate of viscoelastic recovery is faster than the rate of creep", 50th ORS, paper 0046, March (2004). Get pdf. Ligament creep and recovery do not occur at the same rate. This phenomenon cannot be described by either linear viscoelasticity or quasilinear viscoelasticity (QLV). Oza, A., Vanderby, R. and Lakes, R. S., "Generalized solution for predicting relaxation from creep: application to ligament" International Journal of Mechanical Sciences, 48, (6) 662-673 June (2006). Get pdf. Creep and relaxation are two viscoelastic phenomena that are easily interrelated for a linearly viscoelastic material, but interrelationships are complex for nonlinearly viscoelastic materials. We use a single-integral nonlinear superposition principle to relate creep and relaxation, where the kernel is assumed to be a nonseparable product of strain and time. Herein, we develop time dependence as general power laws with up to four terms for creep compliance and relaxation modulus. Higher-order formulations give better results for ligament in terms of curve fitting and prediction of relaxation from creep. This is illustrated by a comparison between a two- and a three-term formulation on the experimental data of rabbit medial collateral ligaments. Also, an interrelation between several aspects of creep and relaxation is presented for arbitrarily high order, and the nature of high-order interrelation is discussed. The generality of the method makes it suitable to phenomenologically model many complex materials, to predict complex behaviors and to therefore reduce the amount of testing for robust material characterization. More recently, the recovery following creep or relaxation was observed to be at a different rate than the creep or relaxation which preceded it. This cannot be predicted or modeled by quasi-linear viscoelasticity (QLV). Duenwald, S. E., Vanderby, Jr., R., Lakes, R. S., "Viscoelastic Relaxation and Recovery of Tendon", Annals of Biomedical Engineering, 37, No. 6, 1131-1140, June (2009). Get pdf. Tendons exhibit complex viscoelastic behaviors during relaxation and recovery. Recovery is critical to predicting behavior in subsequent loading, yet is not well studied. Our goal is to explore time-dependent recovery of these tendons after loading. As a prerequisite, their strain- dependent viscoelastic behaviors during relaxation were also characterized. The porcine digital flexor tendon was used as a model of tendon behavior. Strain-dependent relaxation was observed in tests at 1, 2, 3, 4, 5, and 6% strain. Recovery behavior of the tendon was examined by performing relaxation tests at 6%, then dropping to a low but nonzero strain level. Results show that the rate of relaxation in tendon is indeed a function of strain. Unlike previously reported tests on the medial collateral ligament (MCL), the relaxation rate of tendons increased with increased levels of strain. This strain-dependent relaxation contrasts with quasilinear viscoelasticity (QLV), which predicts equal time dependence across various strains. Also, the tendons did not recover to predicted levels by nonlinear superposition models or QLV, though they did recover partially. This recovery behavior and behavior during subsequent loadings will then become problematic for both quasilinear and nonlinear models to correctly predict. Ligaments, tendons and other soft tissues are nonlinearly viscoelastic. To discriminate among various constitutive equations which may be used to describe the tissue, appropriate experimental modalities are requisite. Ideally, testing should span physiologic ranges for load (or strain), load history (recovery and reloading), and load onset and duration, and a robust model will fit all data. Methods to expand the experimental window of time for relaxation and creep are presented and evaluated. The role of ramp, relaxation and recovery protocols is studied in the context of viscoelasticity describable by linear, quasilinear (QLV), nonlinear superposition, Schapery, and multiple integral formulations. The advantages associated with testing protocols that expand the time windows for creep or relaxation are presented. Three constitutive equations are compared in their ability to model experimental relaxation, recovery and reloading of tissues. Quasi-linear viscoelasticity (QLV) can fit a single stress relaxation curve, but fails to account for the observed strain-dependence in relaxation. Nonlinear superposition can fit the single relaxation curve and will account for the strain-dependent relaxation behavior, but fails to accurately predict experimentally observed recovery behavior. Schapery's nonlinear viscoelastic model successfully fits a single relaxation curve, accounts for strain-dependent relaxation behavior, and accurately predicts recovery and reloading behavior. Comparing Schapery's model to QLV and nonlinear superposition, Schapery's method was uniquely capable of fitting the different nonlinearities that arise in stress relaxation curves from different tissues, e.g. the porcine digital flexor tendon and the porcine medial collateral ligament (MCL), as well as predicting subsequent recovery and tendon relaxation curves after initial loads. The mechanical behavior of tendons has been well studied in vitro. A noninvasive method to acquire mechanical data would be highly beneficial. Elastography has been a promising method of gathering in vivo tissue mechanical behavior, but it has inherent limitations. This study presents acoustoelasticity as an alternative ultrasound-based method of measuring tendon stress and strain by reporting a relationship between ultrasonic echo intensity (B-mode ultrasound image brightness) and mechanical behavior of tendon in vitro. Porcine digital flexor tendons were cyclically loaded in a mechanical testing system while an ultrasonic echo response was recorded. We report that echo intensity closely follows the applied cyclic strain pattern in time with higher strain protocols resulting in larger echo intensity changes. We also report that echo intensity is related nonlinearly to stress and nearly linearly to strain. This indicates that ultrasonic echo intensity is related to the mechanical behavior in a loaded tissue by an acoustoelastic response, as previously described in homogeneous, nearly incompressible materials. Acoustoelasticity is therefore able to relate strain-dependent stiffness and stress to the reflected echo, even in the processed B-mode signals reflected from viscoelastic and inhomogeneous material such as tendon, and is a promising metric to acquire in vivo mechanical data noninvasively. Tendon mechanical properties are thought to degrade during aging but improve with exercise. A remaining question is whether exercise in aged animals provides sufficient regenerative, systemic stimulus to restore younger mechanical behaviors. Herein we address that question with tail tendons from aged and exercised rats, which would be subject to systemic effects but not direct loading from the exercise regimen. Tendon relaxation rate was strain-dependent, consistent with nonlinear superposition or Schapery models but not with quasilinear viscoelasticity (QLV). Trends in exercise data suggest that with exercise, tendons assume the elastic character of younger rats (lower elastic modulus and ultimate stress). LaCroix AS, Duenwald-Kuehl SE, Lakes RS, Vanderby R Jr., Relationship between tendon stiffness and failure: a metaanalysis, J Appl Physiol 115(1):43-51 July 1 (2013). Tendon is a highly specialized, hierarchical tissue designed to transfer forces from muscle to bone; complex viscoelastic and anisotropic behaviors have been extensively characterized for specific subsets of tendons. Reported mechanical data consistently show a pseudoelastic, stress-vs.-strain behavior with a linear slope after an initial toe region. Many studies report a linear, elastic modulus, or Young's modulus (hereafter called elastic modulus) and ultimate stress for their tendon specimens. Individually, these studies are unable to provide a broader, interstudy understanding of tendon mechanical behavior. Herein we present a metaanalysis of pooled mechanical data from a representative sample of tendons from different species. These data include healthy tendons and those altered by injury and healing, genetic modification, allograft preparation, mechanical environment, and age. Fifty studies were selected and analyzed. Despite a wide range of mechanical properties between and within species, elastic modulus and ultimate stress are highly correlated (R(2) = 0.785), suggesting that tendon failure is highly strain-dependent. Furthermore, this relationship was observed to be predictable over controlled ranges of elastic moduli, as would be typical of any individual species. With the knowledge gained through this metaanalysis, noninvasive tools could measure elastic modulus in vivo and reasonably predict ultimate stress (or structural compromise) for diseased or injured tendon. 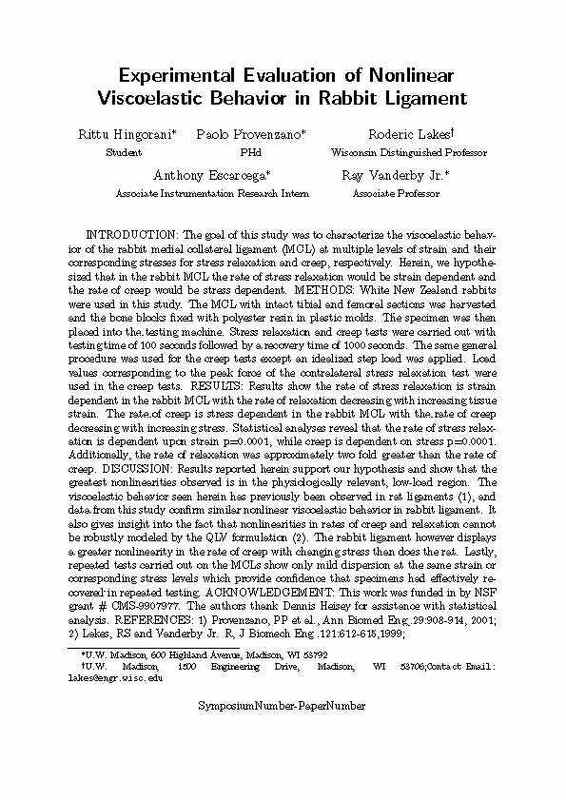 M. Pensalfini, S. Duenwald-Kuehl, J. Kondratko-Mittnacht, R. Lakes, R. Vanderby, Evaluation of Global Load Sharing and Shear-Lag Models to Describe Mechanical Behavior in Partially Lacerated Tendons, J Biomech Eng., 136(9):091006-091006-12 (2014). The mechanical effect of a partial thickness tear or laceration of a tendon is analytically modeled under various assumptions and results are compared with previous experimental data from porcine flexor tendons. Among several fibril-level models considered, a shear- lag model that incorporates fibril-matrix interaction and a fibril-fibril interaction defined by the contact area of the interposed matrix best matched published data for tendons with shallow cuts (less than 50% of the cross-sectional area). Application of this model to the case of many disrupted fibrils is based on linear superposition and is most successful when more fibrils are incorporated into the model. An equally distributed load sharing model for the fraction of remaining intact fibrils was inadequate in that it overestimates the strength for a cut less than half of the tendon's cross-sectional area. In a broader sense, results imply that shear-lag contributes significantly to the general mechanical behavior of tendons when axial loads are nonuniformly distributed over a cross section, although the predominant hierarchical level and microstructural mediators for this behavior require further inquiry. Ex vivo tendon mechanical behavior has been well described under constrained uniaxial tensile testing. During standard loading of rat tail tendon (RTT) fascicles, apparent axial twist was observed. We designed a custom testing setup, utilizing magnetic suspension, to allow unstrained axial rotation during tensile loading. We measured and characterized the rotational behavior of single and paired RTT fascicles under cyclic loading. Mullins-type stress softening was noted across loading cycles as well as rotational softening. Single fascicle nonlinear stretch-twist coupling is well described by the asymptotic function in which fascicles rotated a mean 51.1 degrees within about 1% applied axial strain. Specimen cross-sectional diameter had a noticeable effect on the measured material properties, particularly effective elastic modulus. Such stretch-twist coupling and size dependence cannot be understood via classical elasticity but is predicted by Cosserat (micropolar) elasticity. The current study demonstrates RTT fascicles are chiral based on observed axial load-induced twist. Additionally, our findings support existing research that suggest a helical fascicle structure. Potential consequences of helical substructures, mechanical and biological, should be further investigated. QLV fails to describe observed nonlinear viscoelastic behavior. Ciarletta, P, S Micera, D Accoto, P Dario. A novel microstructural approach in tendon viscoelastic modeling at the fibrillar level. J. Biomechanics 39: 2034-2042, 2006. Elliot, DM, PS Robinson, JA Gimbel, JJ Sarver, JA Abboud, RV Iozzo, LJ Soslowsky. Effect of altered matrix proteins on quasilinear viscoelastic properties in transgenic mouse tail tendons. Ann. Biomed. Eng. 31: 599-605, 2003. Actual experimental results show strain dependence of rate. Sverdlik, A. and Y Lanir. Time-dependent mechanical behavior of sheep digital tendons, including the effects of preconditioning. J. Biomechanical Engineering 124: 78-84, 2002. In addition, bovine cornea has shown similar viscoelastic behavior: In cornea from the eye, creep becomes more pronounced as stress increases. The behavior therefore does not follow quasi-linear viscoelasticity (QLV). Boyce, B. L., Jones, R. E., Nguyen, T. D., Grazier, J. M., Stress-controlled viscoelastic tensile response of bovine cornea, J. Biomechanics, 40, 2637-2376, 2007. The following article shows a trend in ligament viscoelasticity similar to our prior articles. Bonifasi-Lista, C, SP Lake, MS Small, JA Weiss. Viscoelastic properties of the human medial collateral ligament under longitudinal, transverse, and shear loading. J. Orthop. Res. 23: 67-76, 2005. Heart muscle does not follow QLV. The reduced relaxation curves depended significantly on the stretch level. Miller, C. E., Wong, C. L., Trabeculated embryonic myocardium shows rapid stress relaxation and non-quasi-linear viscoelastic behavior, J. Biomechanics, 33, 615-622, 2000. Human amnion does not follow QLV. Michelle L. Oyena, Robert F. Cook, Triantafyllos Stylianopoulos, Victor H. Barocas, Steven E. Calvin, Daniel V. Landers, Uniaxial and biaxial mechanical behavior of human amnion, J. Mater. Res., Vol. 20, No. 11, 2902-2909, Nov 2005. Spinal ligaments do not follow QLV. Kevin L. Troyer, Christian M. Puttlitz, Human cervical spine ligaments exhibit fully nonlinear viscoelastic behavior, Acta Biomaterialia 7, 700-709, 2011. Sveva Ambrosetti-Giudici, Philippe Gedet, Stephen J. Ferguson, Salman Chegini, Juergen Burger, Viscoelastic properties of the ovine posterior spinal ligaments are strain dependent , Clinical Biomechanics 25, 97-102, 2010. Tendons, specifically rat tail tendon fascicles, do not follow QLV. F. M. Davis and R. De Vita, "A nonlinear constitutive model for stress relaxation in ligaments and tendons", Annals of Biomedical Engineering, 40 (12), 2541-2550, 2012. Tutorial on interpreting experiments for nonlinear tissue. We thank the National Science Foundation for support.